Fremont, Calif.—February 26, 2019 –For 20 years, OIF has led the way for the optical network ecosystem – network operators, system vendors, component vendors and test equipment vendors – to collaborate, test and validate the interoperability of the electrical, optical and control solutions that directly impact the industry. Through l ive interoperability demonstrations, Implementation Agreements (IAs), worldwide multi-vendor demonstrations, liaison relationships, technical meetings and much more, OIF’s dynamic membership of 100+ companies has brought about significant forward change in the industry. From its groundbreaking interoperability work in coherent transmission and enabling optical subcomponents to today’s hottest industry topics – 400ZR, Common Electrical I/O (CEI)-112G and Flex Ethernet (FlexE) – OIF and its members’ work advances new technologies and industry interoperability. For more information on OIF’s work in these areas, visit the Hot Topics section of the website here. · At OFC next week, OIF member companies will collaborate to lead interactive interoperability demonstrations of CEI-112G, FlexE and 400ZR solutions that are vital to the global network. · In December 2018, OIF announced its new FlexE 2.1 project, continuing OIF’s lead in FlexE aggregation architectures by keeping current with industry PHY rates. The new FlexE 2.1 project is for FlexE over 50GbE PHY applications and an extension to the recently released FlexE 2.0 IA. · Reinforcing its work to speed the implementation and commercialization of SDN, OIF announced the launch of its newest project in November — “Requirements for Integrated Packet Optical SDN.” The project outlines requirements for a multi-layer SDN reference architecture as a use case for packet optical transport networks. · In October, OIF announced three IAs aimed at expanded interoperability of Flex Ethernet and increased data rates. The completed IAs—FlexE 2.0, FlexE Neighbor Discovery and Common ACO Electrical I/O—reinforce OIF’s work to provide the industry with solutions for flexible deployment and provisioning of network bandwidth. Check the status of OIF’s current work here. In recognition of 20 years of accomplishments and continued market impact, OIF refreshed its logo to reflect its timeless, no-nonsense, authoritative role in the industry. Optical Internetworking Forum (OIF) is where the optical networking industry’s interoperability work gets done. Celebrating 20 years of effecting progressive change in the industry, OIF represents the dynamic ecosystem of 100+ industry leading network operators, system vendors, component vendors and test equipment vendors, all collaborating to develop interoperable electrical, optical and control solutions that directly impact the industry’s ecosystem and facilitate global connectivity in the open network world. Connect with OIF at @OIForum, on LinkedIn and at https://www.oiforum.com. This work continues OIF’s lead in FlexE aggregation architectures by keeping current with industry PHY rates Fremont, Calif.—December 4, 2018 – OIF, the global industry forum accelerating market adoption of advanced interoperable optical networking solutions, today announced the launch of the FlexE 2.1 project and newly elected board members and working group chairs. The new project initiation and elections took place at the Q418 Technical and MA&E Committee meetings held October 29-November 2, 2018 in Sydney, Australia. Fremont, Calif.—October 23, 2018 – Continuing its efforts to drive network connectivity and flexibility worldwide, OIF announced three Interoperability Agreements (IAs) aimed at expanded interoperability of Flex Ethernet and increased data rates. The completed IAs—FlexE 2.0, FlexE Neighbor Discovery and Common ACO Electrical I/O—reinforce OIF’s work to provide the industry with solutions for flexible deployment and provisioning of network bandwidth. “The completion of these projects reinforces OIF’s commitment to provide the industry with the flexibility and increased bandwidth solutions combined with increased data speeds it requires to keep up with market demands and drive solutions that enable the next generation of networks,” explained Dave Stauffer of Kandou Bus and OIF’s Physical and Link Layer (PLL) Working Group Chair. Initiated in 2016, the FlexE 2.0 project enables equipment to support new Ethernet connection types and FlexE allows network providers and operators to utilize optical transport network bandwidth in more flexible ways. FlexE can deterministically utilize the entire aggregated link, creating a more efficient alternative to the traditional IEEE 802.3ad or IEEE 802.1-based Link Aggregation (LAG) solutions which often can only utilize 70-80% of the available bandwidth. Key features of the FlexE 2.0 project include adding support for FlexE groups composed of 200GBASE-R and 400GBASE-R PHYs, in addition to groups composed of 100GBASE-R PHYs, and adding an option for the support of time and frequency synchronization at the FlexE group level. The FlexE Neighbor Discovery project recognizes that FlexE capability discovery is still required to facilitate the setup of FlexE groups and clients. The project introduced some extensions to the Link Layer Discovery Protocol (LLDP) for FlexE capability discovery. It enables remote FlexE PHY and deskew capability discovery, PHY connectivity discovery and verifications, and FlexE Group subgroup integrity verification. The implementation agreement for Common Analog Coherent Optics (ACO) Electrical I/O follows the success of the CFP2-ACO optical transceiver implementation agreement but is form factor agnostic, so it also benefits analog coherent modules based on such form factors as CFP4, CFP8, QSFP, microQSFP, QSFP-DD and OSFP. The project defines the ACO electrical I/O independent of the choice of form factor and optical carrier count for 45 Gbaud and 64 Gbaud per-carrier applications. “We recognize that the data center and communications industries require solutions for flexible deployment and provisioning of network bandwidth combined with component level interoperable infrastructure that can enable system capacity demands,” Stauffer continued. OIF Day at CenturyLink was held on October 16, 2018 in Littleton, CO. The interactive and educational workshop featured OIF and CenturyLink subject matter experts covering: OIF projects and directions including Networking Transport SDN work and an overview of Physical & Link Layer work. The Optical Internetworking Forum (OIF) in collaboration with the Open Networking Foundation (ONF) and the Metro Ethernet Forum (MEF) have tested the second-generation transport application programming interface (T-API 2.0). T-API 2.0 is a standardised interface, released in late 2017 by the ONF, that enables the dynamic allocation of transport resources using software-defined networking (SDN) technology. The interface has been created so that when a service provider, or one of its customers, requests a service, the required resources including the underlying transport are configured promptly. The OIF-led interoperability demonstration tested T-API 2.0 in dynamic use cases involving equipment from several systems vendors. Four service providers – CenturyLink, Telefonica, China Telecom and SK Telecom – provided their networking labs, located in three continents, for the testing. SDN technology is generally associated with the packet layer but there is also a need for transport links, from fibre and wavelength-division multiplexing technology at Layer 0 through to Layer 2 Ethernet. Another difference is that at the packet layer with its manipulation of packet headers is a digital domain whereas the photonic layer is analogue. “A lot of the details of how a signal interacts with a fibre, with the wavelength-selective switches, and with the different componentry that is used at Layer 0, are important in order to characterise whether the signal makes it through the network,” says Sadler. Prior to SDN, control functions resided on a platform as part of a network’s distributed control plane. Each vendor had their own interface between the control and the optical domain embedded within their platforms. T-API has been created to expose and standardise that interface such that applications can request transport resources independent of the underlying vendor equipment. NBI refers to a northbound interface while SBI stands for a southbound interface. Source: OIF. To fulfil a connection across an operator’s network involves a hierarchy of SDN controllers. An application’s request is first handled by a multi-domain SDN controller that decomposes the request for the various domain controllers associated with the vendor-specific platforms. T-API 2.0’s role is to link the multi-domain controller to the application layer’s orchestrator and also connect the individual domain controllers to the multi-domain SDN controller (see diagram above). T-API is an example of a northbound interface. The ONF developed the first T-API interface as part of its Common Information Model (CIM) work. The interface was tested in 2016 as part of a previous interoperability demonstration involving the OIF and the ONF. One important shortfall revealed during the 2016 demonstrations, and which has slowed its deployment, is that the T-API 1.0 interface didn’t fully define how to notify an upper controller of events in the lower domains. For example, if a link is congested, or worst, lost, it couldn’t inform the upper controller to re-route traffic. This has been put right with T-API 2.0. “T-API 1.0 is a configure and step-away deployment, T-API 2.0 is where the dynamic reactions to things happening in the network become possible,” says Sadler. In addition to the four service providers, six systems vendors took part in the recent interoperability demonstration: ADVA Optical Networking, Coriant, Infinera, NEC/ Netcracker, Nokia and SM Optics. The recent tests focussed on the performance of the TAPI-2.0 interface under dynamic network conditions. Another change since the 2016 tests was the involvement of the MEF. The MEF has adopted and extended T-API as part of its Network Resource Modeling (NRM) and Network Resource Provisioning (NRP) projects, elements of the MEF’s Lifecycle Service Orchestration (LSO) architecture. The LSO allows for service provisioning using T-API extensions that support the MEF’s Carrier Ethernet services. Three aspects of the T-API 2.0 interface were tested as part of the use cases: connectivity, topology and notification. Setting up a service requires both connectivity and topology. Topology refers to how a service is represented in terms of the node edge points and the links. Notification refers to the northbound aspect of the interface, pushing information upwards to the orchestrator at the application layer. This allows the orchestrator in a multi-domain network to re-route connectivity services across domains. The four use cases tested included multi-layer network connections whereby topology information is retrieved from a multi-domain network with services provisioned across domains. T-API 2.0 was also used to show the successful re-routing of traffic when network situations change such as a fault, congestion, or to accommodate maintenance work. Re-routing can be performed across the same layer such as the IP, Ethernet or optical layer, or, more optimally, across two or more layers. Such a capability promises operators the ability to automate re-routing using SDN technology. The two other use cases tested during the recent demonstration were the orchestrator performing network restoration across two or more domains, and the linking of data centres’ network functions virtualisation infrastructure (NFVI). 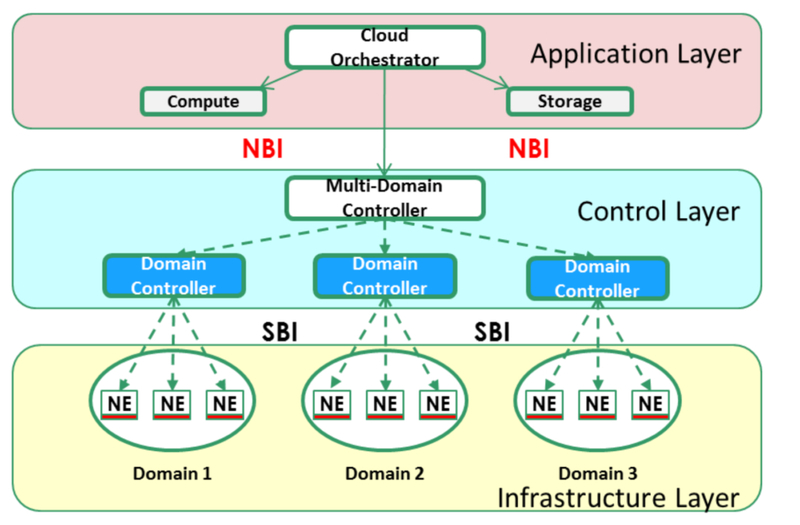 Such NFVI interconnect is a complex use case involving SDN controllers using T-API to create a set of wide area networks connecting the NFV sites. The use case set up is shown in the diagram below. SK Telecom, one of the operators that participated in the interoperability demonstration, welcomes the advent of T-API 2.0 and says how such APIs will allow operators to enable services more promptly. SK Telecom stresses the importance of open APIs in general as part of its network transformation plans. As well as implementing a 5G Standalone (SA) Core, SK Telecom aims to provide NFV and SDN-based services across its network infrastructure including optical transport, IP, data centres, wired access as well as networks for enterprise customers. The OIF says the use cases have shown that T-API 2.0 enables real-time orchestration and that the main shortcomings identified with the first T-API interface have been addressed with T-API 2.0. The OIF recognises that while T-API may not be the sole approach available for the industry – the IETF has a separate activity – the successful tests and the broad involvement of organisations such as the ONF and MEF make a strong case for T-API 2.0 as the approach for operators as they seek to automate their networks. “When it comes to the orchestrator tying into the transport network, we do believe T-API will be one of the main approaches for these APIs,“ says Sadler. SK Telecom said participating in the interop demonstrations enabled it to test and verify, at a global level, APIs that the operators and equipment manufacturers have been working on. And from a business perspective, the demonstration work confirmed to SK Telecom the potential of the ‘global network-as-a-service’ concept. Editor note: Added input from SK Telecom on September 1st. Additionally, Juan Pedro Fernández Palacios, Head of Unit, Telefónica will discuss Telefonica’s view of the demo results and use cases during his NGON keynote presentation tomorrow, June 27th. OIF, in collaboration with MEF, is leading the industry toward the validation and widespread commercialization of T-API 2.0 from the Open Networking Foundation (ONF) as a standard northbound interface (NBI) to transport network controllers. The multi-vendor demo led by four network operator labs included lab deployed and cloud deployed systems testing new dynamic behavior use cases and deployment scenarios. The demo also incorporated service provisioning scenarios at the LSO Presto reference point in the MEF LSO architecture, using the MEF NRP Interface Profile Specification (MEF 60), which defines extensions to T-API in support of Carrier Ethernet services. Participating network operators were CenturyLink, China Telecom, SK Telecom and Telefónica and vendors included ADVA, Coriant, Infinera, NEC/Netcracker, Nokia and SM Optics. Centre Tecnològic de Telecomunicacions de Catalunya (CTTC) was a participating academic institution and TELUS Communications participated as a consulting network operator. Additionally, two private events detailing the test results will be held with participating network operators: CenturyLink on July 10 in Denver, Colorado and China Telecom on July 19 in Beijing. Members of the media and analyst community interested in attending, please contact leah@wilkinson.associates. A technical white paper and an executive summary of the demo result will be available in August. Committed to accelerating the commercialization of transport SDN worldwide, the Optical Internetworking Forum (OIF), in collaboration with MEF, will bring new dynamic behavior use cases and deployment scenarios into network operator labs around the world to test multi-vendor interoperability of the industry leading T-API 2.0 northbound interface (NBI) from the Open Networking Foundation (ONF). The 2018 Software-Defined Networking (SDN) Transport Application Programming Interface (T-API) interoperability demonstration builds on the OIF’s 2016 interoperability test and demonstration which addressed multi-layer and multi-domain environments as well as on the 2014 demo which prototyped the use of Northbound APIs and helped advance transport SDN standardization. For an infographic of the demo, click here. Fremont, Calif.—June 12, 2018 – The OIF (Optical Internetworking Forum) today announced the launch of the CEI-112G-XSR project for Die-to-Die (D2D) and Die-to-Optical Engine (D2OE) Common Electrical Interface at the Q218 Technical and MA&E Committees meeting held April 24-26, 2018 in Nuremberg, Germany. The project aims at enabling intra-package interconnects to optical engines or between dies with high throughput density and low normalized power operating in the data rate range of 72-116 Gbps with a reach up to 50 mm. In addition to the already existing CEI-112G-MCM OIF project, which is dedicated to wide, high bandwidth CMOS-to-CMOS interconnects, the new CEI-112G-XSR project proposes to support technology mix, in particular CMOS-to-SiGe (Silicon Germanium), which is frequently used to build optical engines. System-in-package (SIP) leads to a requirement of supporting up to 50 mm trace length between the multiple chips on a common (organic) package substrate. “We jointly designed this project to address the problem of integrating multiple dies, including driver devices for optical engines on non-CMOS technologies, onto a common substrate within a large multi-chip-package design. Supporting this mix of technology allows combining the high logic density of CMOS devices with the high drive strength of analog components,” explained Klaus-Holger Otto of Nokia and OIF Technical Committee Chair. Allow lower normalized power, double shoreline throughput density and provide a multi-source 72-116 Gbps D2D and D2OE electrical I/O interface. This will enhance the integration, normalized power reduction, and cost reduction for integrated OE, multiple-die SIPs. Enable 1 to N lanes of 72-116 Gbps electrical I/Os (e.g. on ASIC/FPGA/OE). Following the quarterly meeting, a sizeable group of OIF members participated in an OIF Day event at the Nokia Nuremberg facility on April 27, 2018. The OIF Day Program is a live educational workshop program to expand awareness of, and educate member company employees on the work of the OIF. The OIF Day event is conducted at network operator and/or vendor sites to reach and obtain inputs from a range of support functions, e.g. operations, network planning, network management, marketing, etc. It is custom-tailored to the needs of each hosting company and comprised of general sessions and tracks focused on Networking and/or Physical and Link Layer topics. OIF also recently conducted a survey of OIF members and non-members, including network operators and vendors, on the OIF’s proposed certification project for Transport-API (T-API) for Transport SDN. Nearly 30 responses to the survey were received – 20+ from network operators and 9 from vendors. The OIF will consider the feedback in any proposal to expand the current program to include T-API certification. 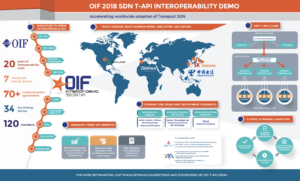 Fremont, Calif. —April 10, 2018 – Committed to accelerating the commercialization of transport SDN worldwide, the Optical Internetworking Forum (OIF) today announced plans for its 2018 Software-Defined Networking (SDN) Transport Application Programming Interface (T-API) interoperability demonstration. In collaboration with MEF, this year’s demonstration will bring new dynamic behavior use cases and deployment scenarios into network operator labs around the world to test and validate the industry leading T-API 2.0 northbound interface (NBI) from the Open Networking Foundation (ONF). The 2018 event builds on the OIF’s previous 2016 interoperability test and demonstration which addressed multi-layer and multi-domain environments as well as on the 2014 demo which prototyped the use of Northbound APIs and helped advance transport SDN standardization. The event will also incorporate service provisioning scenarios at the LSO (Lifecycle Service Orchestration) Presto reference point in the MEF LSO architecture, using the MEF NRP Interface Profile Specification (MEF 60), which defines T-API extensions in support of MEF Carrier Ethernet services. Network operators are rapidly moving toward giving customers and their applications the ability to dynamically control services, and do it in real-time. The days of waiting for service changes will soon be a thing of the past. To achieve this, they need the ability to dynamically move capacity quickly in open networks to avoid network congestion and provide better services to customers. “The work done by OIF is critically important to network operators around the world as we work to provide our customers with better services and higher efficiency, which will definitely help the monetization of our network capacity,” said Dr. Junjie Li, China Telecom and OIF Network Operator Working Group Chair. The international joint-network operator, multi-vendor optical networking interoperability demonstration includes network operator hosts CenturyLink, China Telecom, SK Telecom and Telefonica and participating vendors include ADVA Optical Networking SE, Coriant, NEC/Netcracker, Nokia, SM Optics and ZTE Corporation. Centre Tecnològic Telecomunicacions Catalunya is the participating academic and/or research institution and TELUS Communications is participating as a consulting network operator. Committed to accelerating the commercialization of transport SDN worldwide, the Optical Internetworking Forum (OIF), in collaboration with MEF, will bring new dynamic behavior use cases and deployment scenarios into network operator labs around the world to test multi-vendor interoperability of the industry leading T-API 2.0 northbound interface (NBI) from the Open Networking Foundation (ONF). The 2018 Software-Defined Networking (SDN) Transport Application Programming Interface (T-API) interoperability demonstration builds on the OIF’s 2016 interoperability test and demonstration which addressed multi-layer and multi-domain environments as well as on the 2014 demo which prototyped the use of Northbound APIs and helped advance transport SDN standardization. The Optical Internetworking Forum (OIF) is winding down a six-week long interoperability demo on the Transport Application Programming Interface (T-API) standard from the Open Networking Foundation (ONF). The demo started in mid-October and will conclude in early December. Participants executed a multi-domain path selection and recovery test plan with intra-lab and inter-lab testing across multiple global carrier labs. The results of the demo will be shared in three invitation-only read-out events at China Telecom, Telefonica and Verizon for participating companies. A public readout event will take place at the OFC Conference in Los Angeles, March 21, 2017. “Shaping next-generation technology through discussion and collaboration is key to commercial SDN deployment. Verizon’s role as a host carrier for OIF’s interoperability testing of the global SDN T-API underscores our commitment to solving problems that will help evolve the efficiencies needed in the next-generation network,” said Glenn Wellbrock, director, transport network architecture, design and planning, Verizon. Moderator: Dave Brown, OIF President, Nokia. Panelists: Jonathan Sadler, OIF Board Member, Coriant; Lyndon Ong, OIF MA&E Committee co-chair Networking, Ciena; Victor Lopez, Telefonica. A technical white paper and an executive summary of the demo will be available in early February. The OIF and the ONF are partnering to lead the industry toward the wide scale deployment of commercial SDN by testing key Transport Application Programming Interfaces (T-API). The interoperability test and demonstration, managed by the OIF, will address multi-layer and multi-domain environments in global carrier labs. The testing builds on the 2014 demo which was based on prototype T-APIs and helped advance transport SDN standardization. Additional use cases based upon the API standards will be clarified during the testing and defined through OIF implementation agreements to provide a common set of requirements. Global Carrier participants hosting the interoperability testing include China Telecom, China Unicom, SK Telecom, Telefonica and Verizon. Participating vendors include ADVA Optical Networking, Ciena, Coriant, Huawei Technologies Co., Ltd., Infinera, Juniper Networks, NEC Corporation, Sedona Systems, and SM Optics. Consulting carriers include Orange and TELUS. Academic and/or research institution participants include China Academy of Telecommunication Research (CATR) and Centre Tecnològic de Telecomunicacions de Catalunya (CTTC).